Tonight in Paris, the Eiffel Tower was illuminated in the colours of the national flag to mourn those lost in Friday’s attack. France’s iconic tower is lit with red, white and blue tonight to pay tribute to the victims of the Paris attacks last Friday. 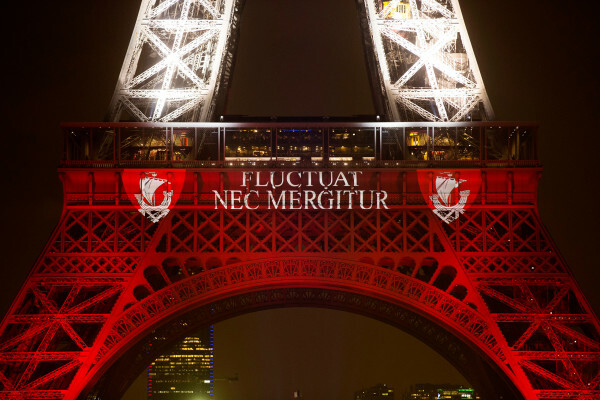 The tallest structure in the City of Light and the iconic international symbol of France, reopened on Monday. From Monday night to midnight Tuesday, the famous tower will project the city motto “Fluctuat Nec Mergitur” – ‘tossed by the waves but does not sink’ to continue 3 days of national mourning.